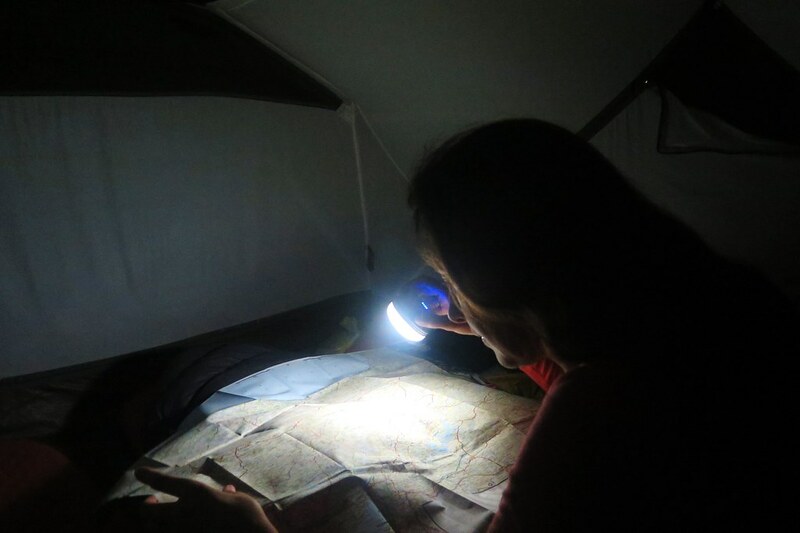 We had another whole day and night on the boat crossing the Caspian. After a long lie in and a walk around the ship there wasn’t too much to do other than chill in our cabin watching tv shows on the laptop. (Conveniently we’d downloaded series 2 of Narcos while waiting in Aktau!) 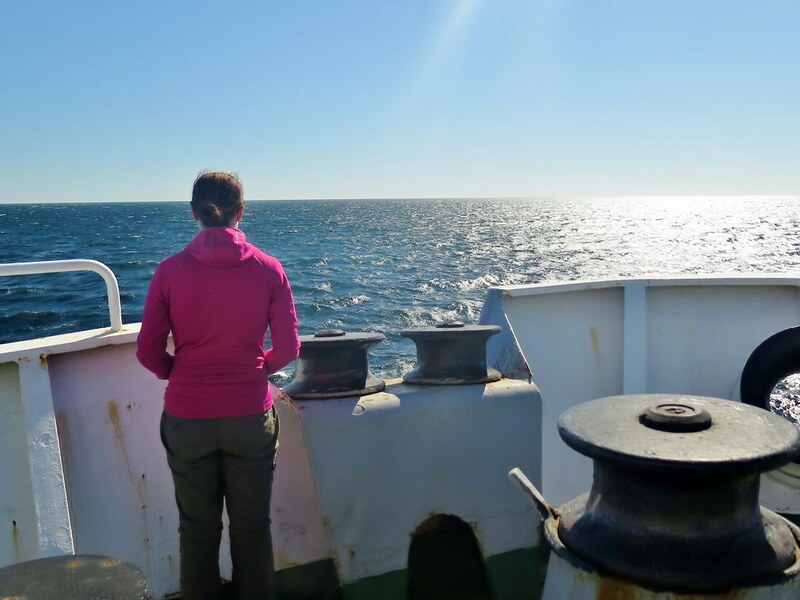 On the second morning, we could see land off to our right (starboard!) 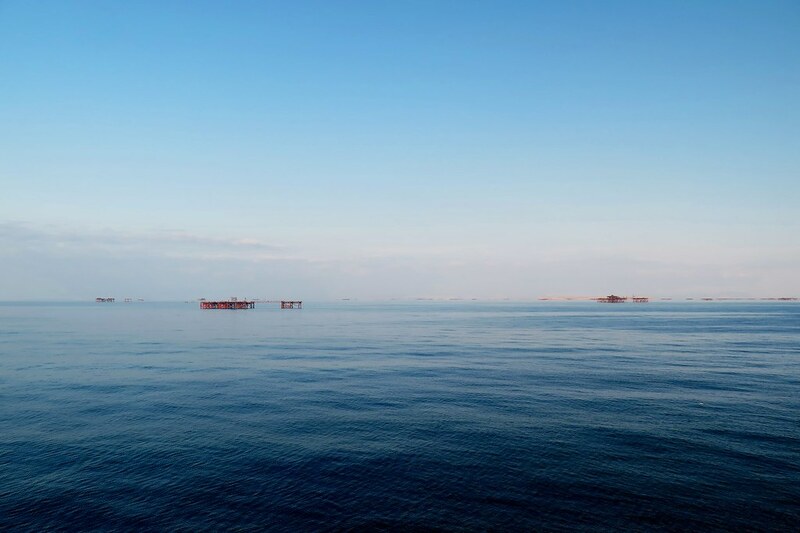 side and a load of oil platforms in the sea around us. A few years ago, the boat would dock at the port right inside Baku, but now they use the ‘Baku International Seaport’ which is, inconveniently, 70km south of the city. By about 10 clock we were in port waiting to disembark. There was a bit of a wait but when we were led down to the passport check area, the truck drivers kindly let us go through first so we could get our bikes off before the trucks started offloading. 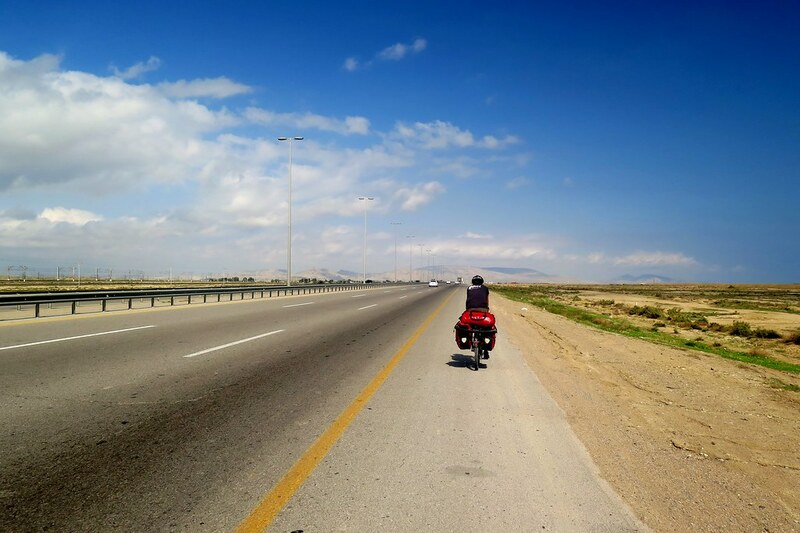 Just before midday, we were through customs and back on the road. Country number 13. We joined a 3 lane highway heading towards Baku. We had quite a wide shoulder to ride in so even though the traffic was moving pretty quickly, it was comfortable riding. 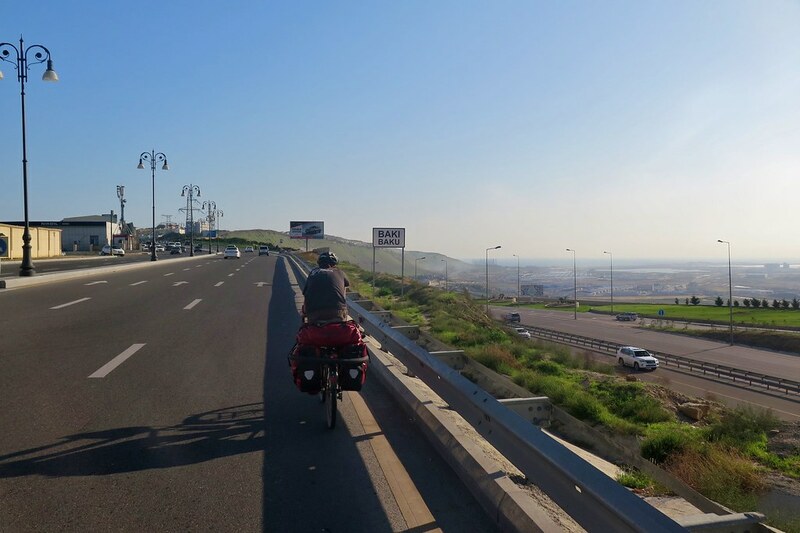 At times we were right next to the sea, at others riding through big new housing and commercial developments on the outskirts of the city. 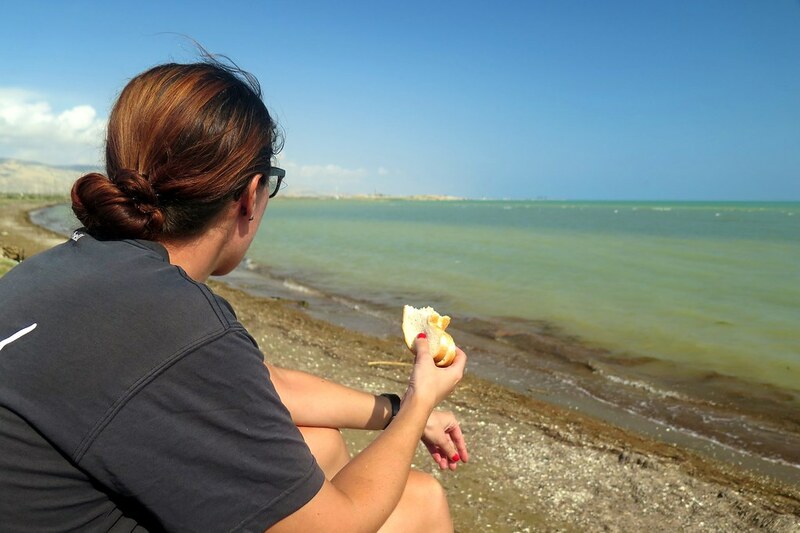 We had a tailwind so even with a quick break for a cheese sandwich on a ‘beach’ we made good time. Coming into town, the road climbed up and over a ridge which was tough work in the heat. We passed signs for Baku’s 2015 European Games. Are we in Europe? Are we still in Asia? Is Eurasia a real place? Who knows. But as we arrived downtown, it was very apparent we were not in Central Asia anymore! Baku is booming – oil money. Brand new buildings, luxury car showrooms and fashionable people everywhere. I can kind of understand why Aktau feels like a bit of a Soviet dump to people arriving from Baku in the other direction. 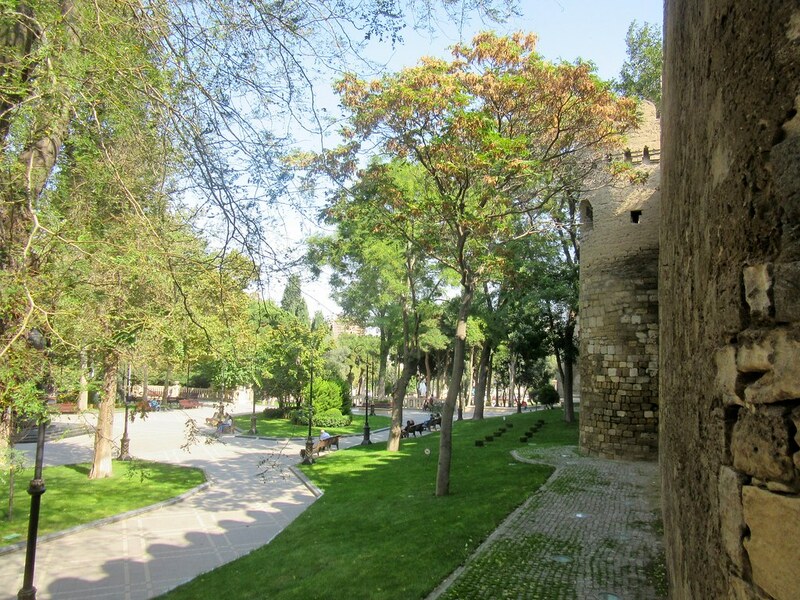 We found our way through an old city wall and into the old town area. A local guy stopped us and asked us the usual questions. He then led us through the narrow alleyways to help us find a hostel, and bargained them down to get us a good price. 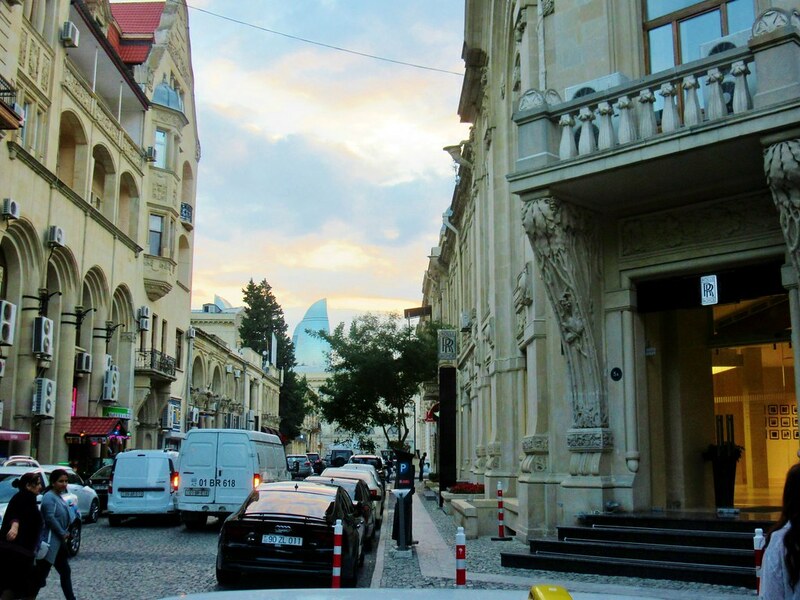 We spent a few nights in Baku, thoroughly enjoying being in a modern city. We found a decent bike shop where I got a new hub for my front wheel. Then at a huge shopping mall nearby, Clare got a new waterproof jacket. She’d left hers in a field back in Kyrgyzstan. Fortunately we hadn’t had any major rain since then (but that’s going to change…) I also managed to get a new e-reader as I managed to spill water all over my old one. We, of course, went out for some good food too. The highlight was a french meal at ‘Paris Bistro.’ Steak, duck, mussels, creme brulee, red wine, basically all the stuff we’d been fantasizing about when we were tucking into another round of instant noodles in Tajikistan! 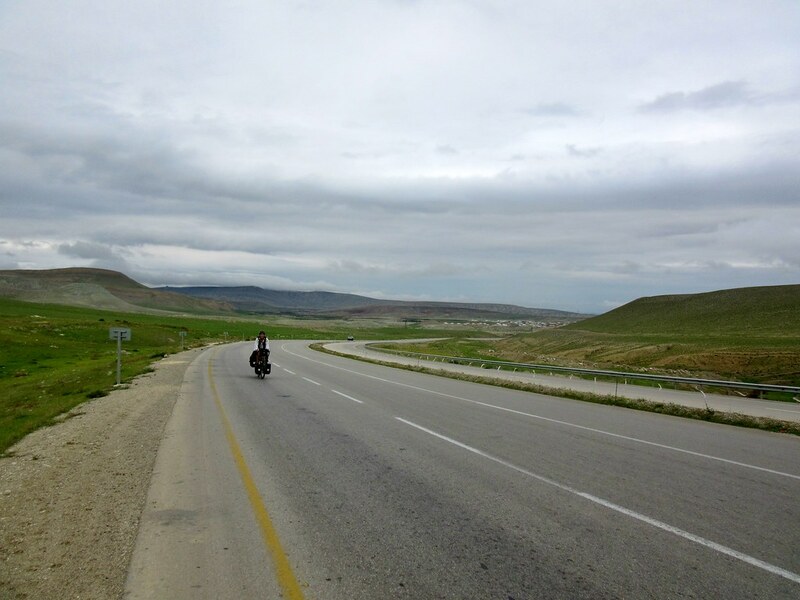 Riding west through Azerbaijan, it seems that there’s two choices of routes, north or south. The south route looks easier and flatter, but not very interesting. The northern road is more mountainous but passes through better scenery and a number of nice towns. 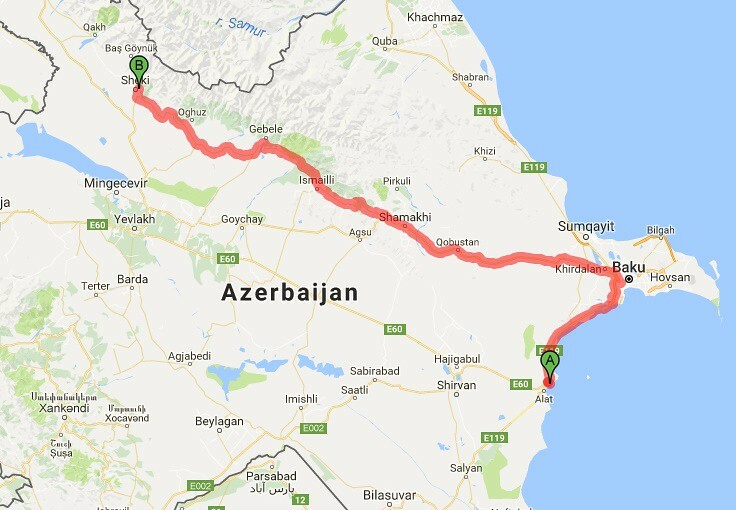 The north was the obvious choice, so we set off out of Baku in that direction. 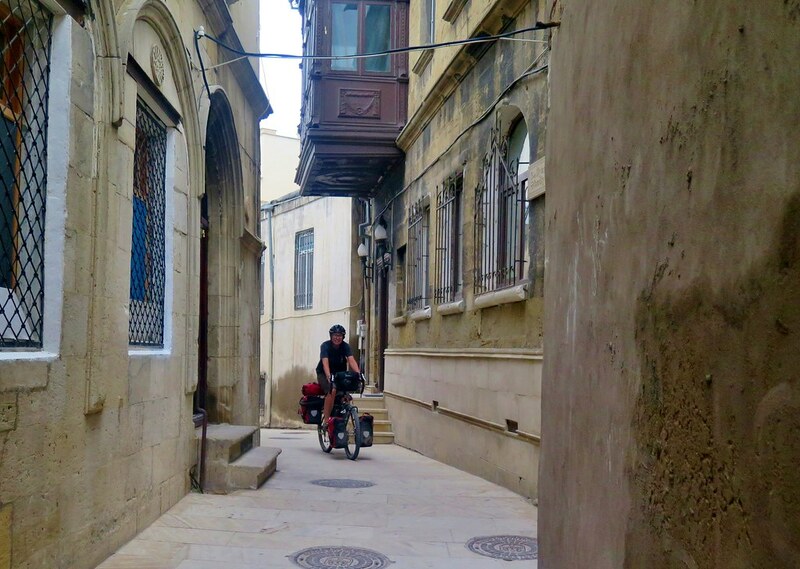 Leaving the city, we negotiated the narrow alleys of the old town, then followed a short section of the course from the recent European Grand Prix. Not often you can ride your bike on a Formula 1 circuit! After that excitement, the rest of the morning was the same as riding out of any other big city, with big roads and heavy traffic. After several sunny days in Baku, the weather had turned for us starting cycling again. We had grey skies and gusty winds which made the day feel quite chilly. 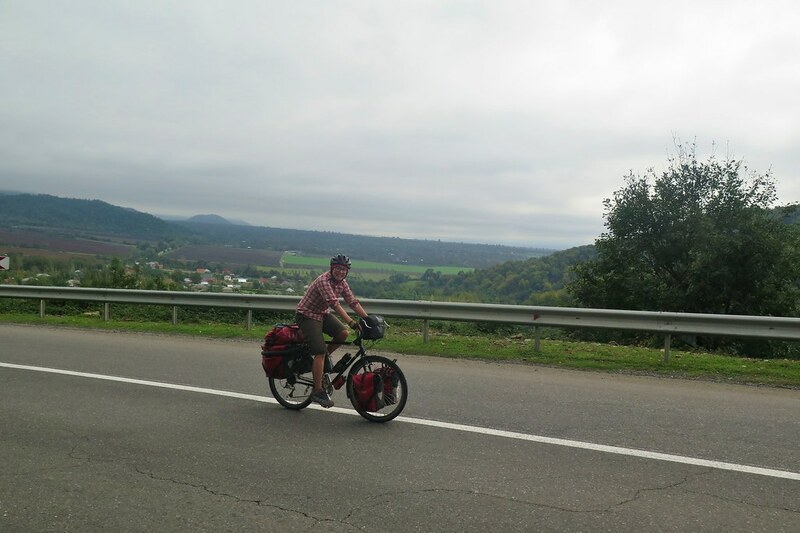 By mid afternoon we had left the city behind and were riding through empty rolling hills. I’d seen some mud volcanos marked on the map near the road. 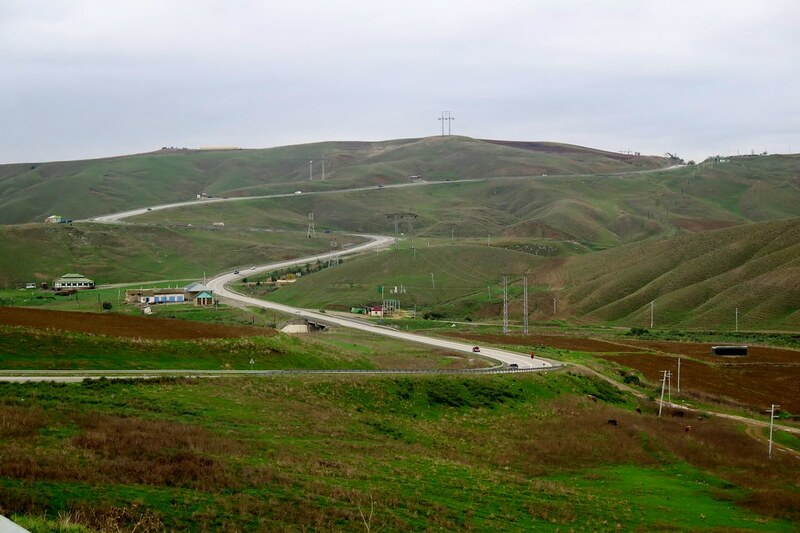 Azerbaijan is known for having all sorts of geological activity going on under the ground, characteristic of oil rich areas. 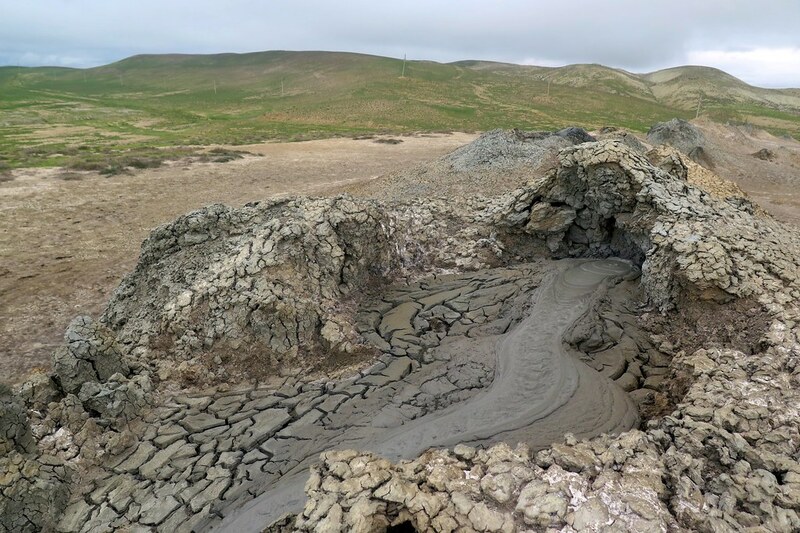 There are a few famous spots where hillsides spout flames or there are big geysers, but all over the place there are many more smaller mud pools. We stopped at roughly where we thought they should be but couldn’t really see anything, so walked up to the top of the hill to try and get a better view. 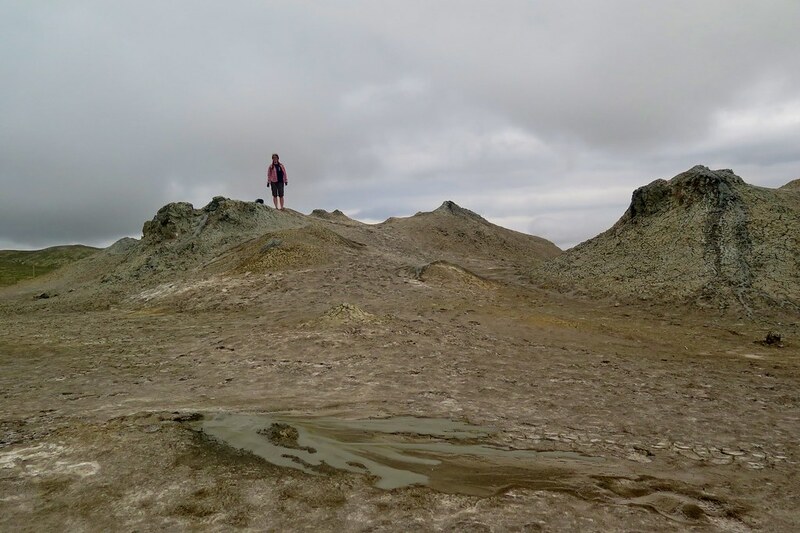 I was expecting a smell of sulphur or some steam to indicate where they might be, but once we got up there, we saw a group of several muddy cones bubbling away quietly. Not super spectacular but it was interesting to see and an excuse for a tea break. We pushed on through the afternoon, covering some decent distance on a very good road surface. 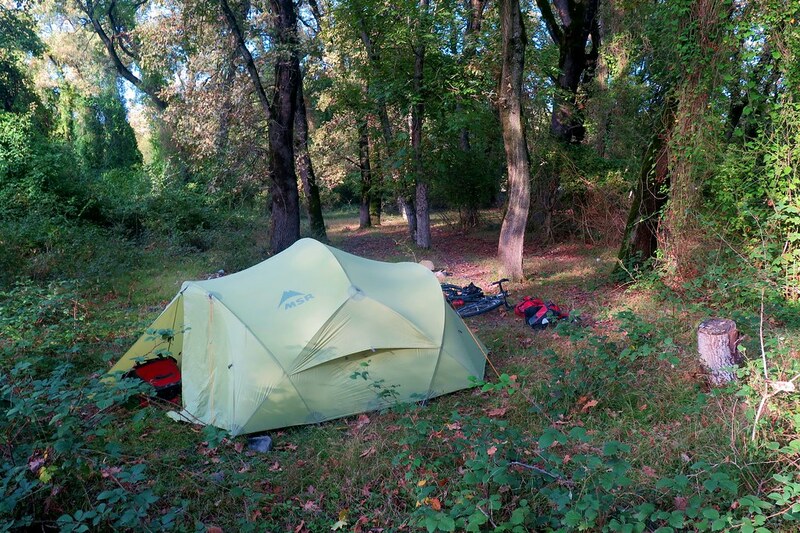 It was easy finding a place to pitch the tent, we just wheeled the bikes off the road and behind some low trees that made sure we were out of sight. Overnight, the rain started and didn’t really let up until morning. We stayed warm and dry in the tent, waiting until about 10 o’clock when there was a break in the rain to get out and start packing up. Annoyingly, the packed dry ground we pushed the bikes over the day before had turned to mud in the rain. We did our best to keep things clean, but when we were back on the road everything was pretty damp and muddy. Now we were getting into the hills, with some steep climbs followed by equally steep descents. Unfortunately, the grey skies and mist meant we couldn’t see much. The higher we got, I’m sure the views would’ve been really good, but with the wind and rain, everything felt quite bleak. We pushed on through the day, Clare very happy to have bought a new waterproof jacket. Later in the afternoon near the town of Samaxi we decided to stop at a roadside cafe for some hot chai and some food. We had no clue what to order but we just gestured that we wanted something to eat. We were led over to a little cabin where we sat inside in the warm drinking tea waiting for the mystery food to appear. We ended up with some really delicious grilled fish, fresh bread and a load of different side dishes. Embarassingly it was the first local food we’d eaten, as thus far it’d been western food in Baku or camp food! 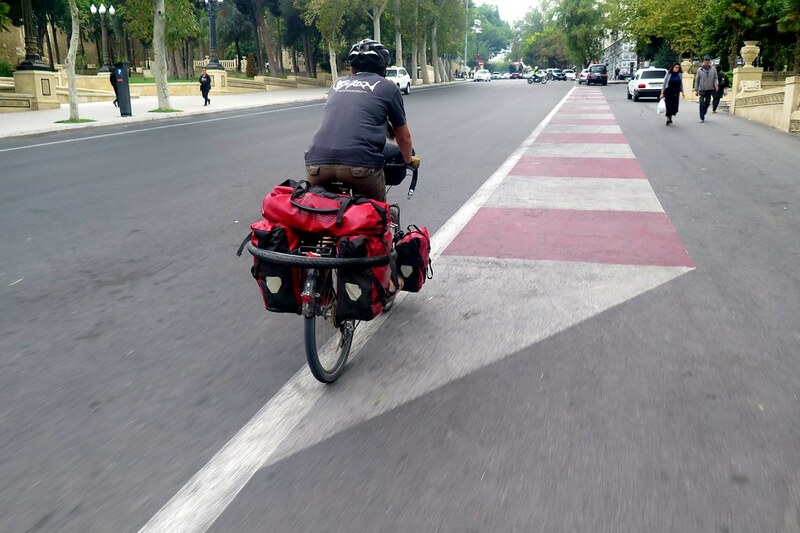 We lingered for a while with our late lunch/early dinner before hitting the road again to cycle through Samaxi and find a camp spot on the other side of town. Again, the rain was relentless overnight. 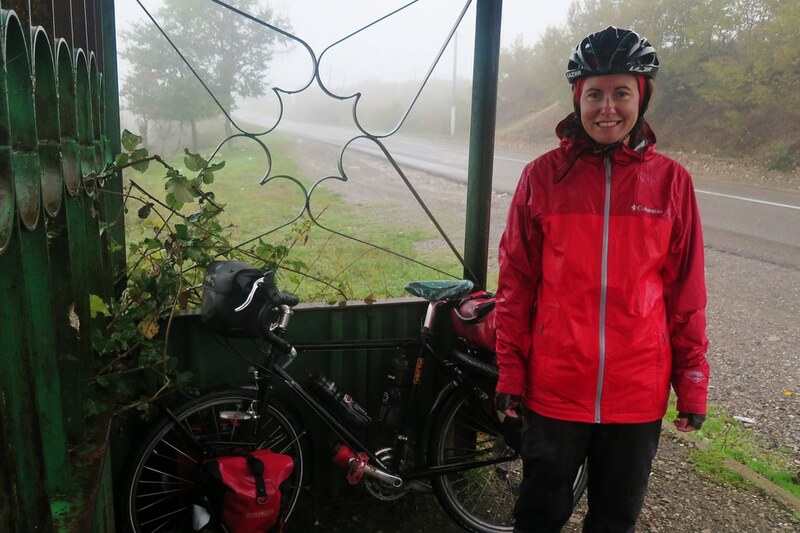 We didn’t even get much of a break in the morning so we packed up in the rain, getting ourselves and our panniers quite muddy in the process. 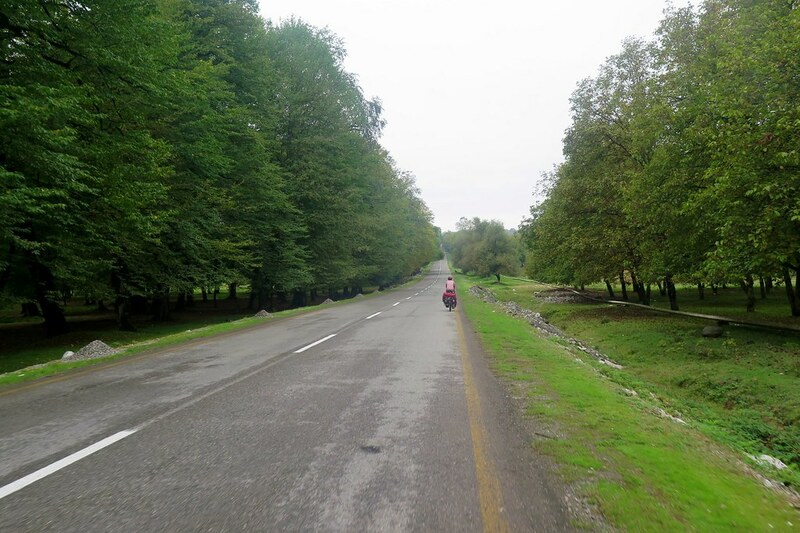 The morning’s riding was quite unpleasant as we were in the hills surrounded by clouds. On the climbs, we were getting really warm and sweating inside our waterproofs, then on the fast downhills we were getting cold very quickly. We stopped in a bus shelter to make some coffee and warm up, and a unanimous decision was made to get to the next town and look for a guest house. 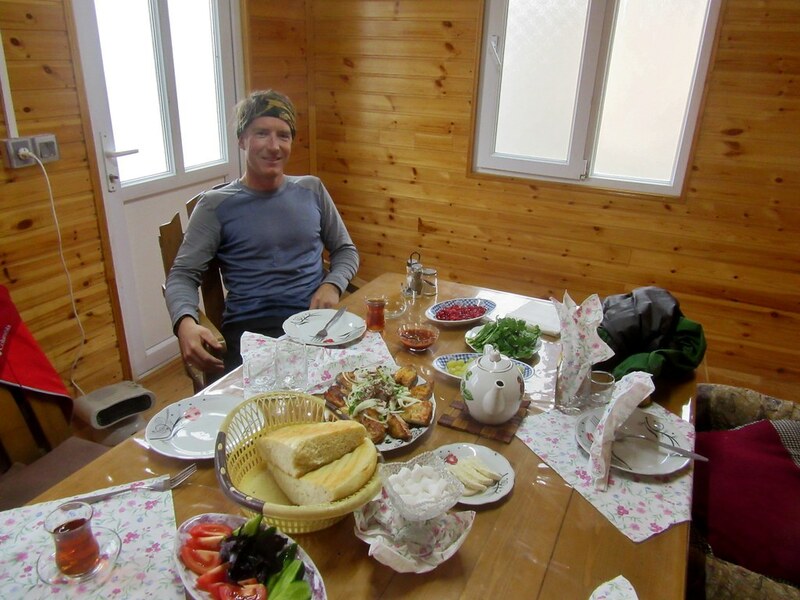 By early afternoon we arrived at Ismailli and had some lunch before heading to a hotel marked on the map. It really wasn’t the oasis of warmth we were hoping for. It was a big grey building and we were shown to a concrete floored box room with broken windows and no hot water. Our tent seemed like a more attractive option so we decided to push on. Luckily though, 500 metres further down the road I spotted a sign for a hotel, and we got a clean, warm room with an amazing hot shower. We got everything out to dry overnight and after washing and drying ourselves we were feeling a lot better. The next day the weather started to change. 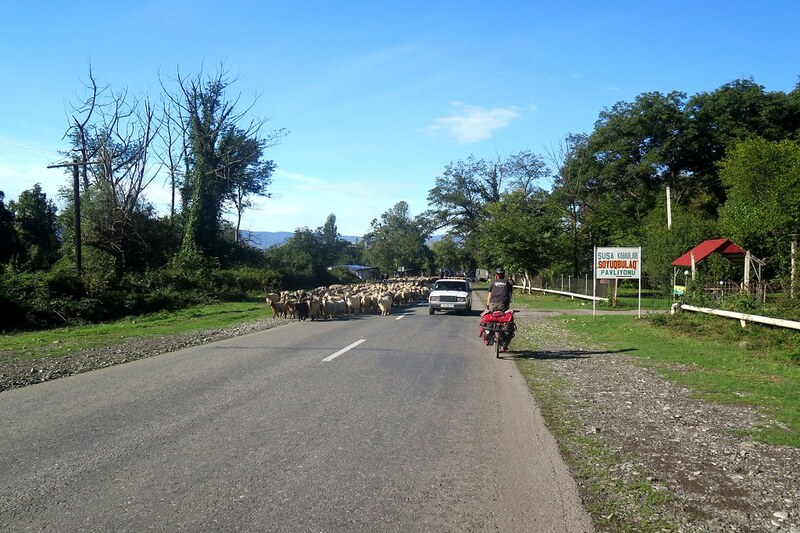 Riding away from Ismailli, the sky was still grey but the clouds were higher and there was no rain. We could see more of our surroundings too, nice green woodland and rolling countryside. To the north we could see bigger mountains, still shrouded in cloud, but with the start of the autumn colours appearing in the trees. 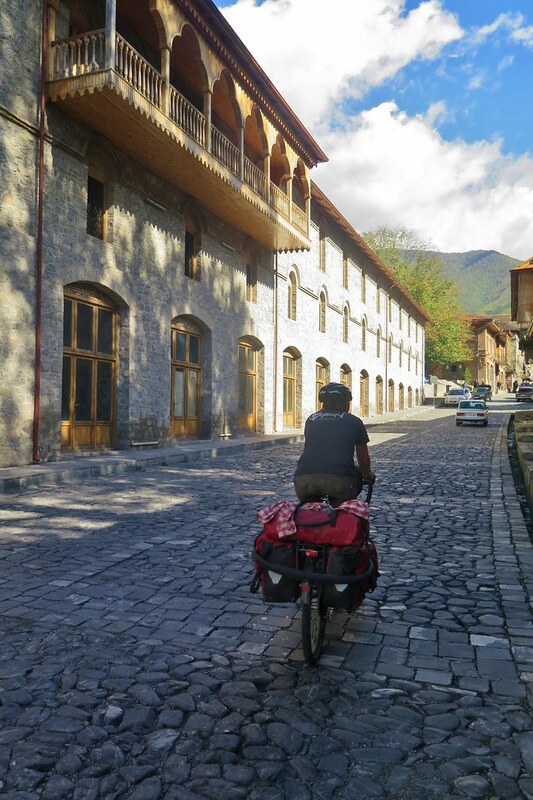 With quite a bit of climbing through the morning we’d only covered baout 40km by time we stopped for lunch in Qabala. A delicious lamb stew washed down with plenty of hot chai and we ready to set off for the afternoon. Rejoining the road, we were coasting gently downhill for the next 20km. We reached a flat valley with the mountains away to our right and we saw blue skies for the first time in a few days. 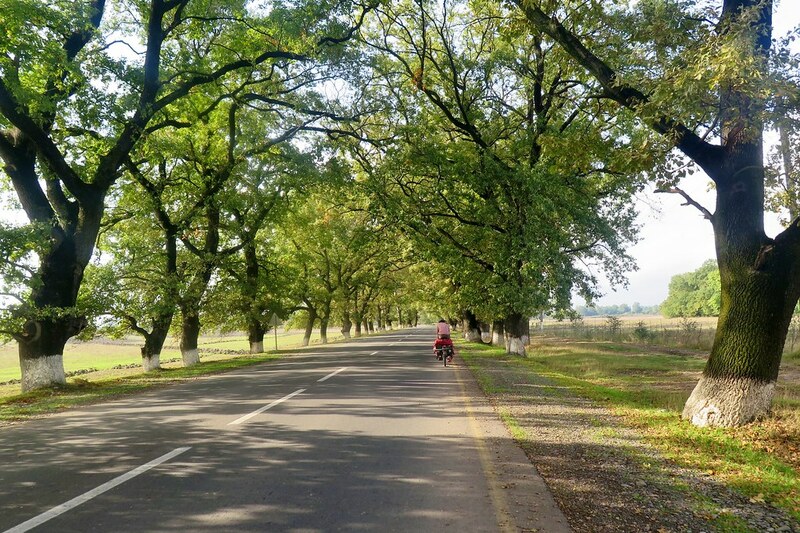 The rest of the day was really fun, riding in the sunshine along lovely tree lined roads keeping up a good average speed. We made it to about 85km then stopped for a drink at a roadside shop. A young guy there was intrigued, wanting to try on our helmets and ride our bikes. The people here really have been friendly, especially so in more rural areas. A little further on we started looking for somewhere to camp. A lot of the land around us was farmed and the road was bordered on both sides by deep ditches. We were a bit picky with where we stopped too, as we really wanted to avoid the mud if it rained again in the night. Soon the road passed through some woodland so we headed into the trees and found a nice flat spot well hidden from the road. Everything was nice and dry after our night in the hotel so it felt good getting into the tent after a great day. There was a bit of rain in the night but only a couple of showers and we were well sheltered by the trees. We had a shorter ride of about 45km the next day. 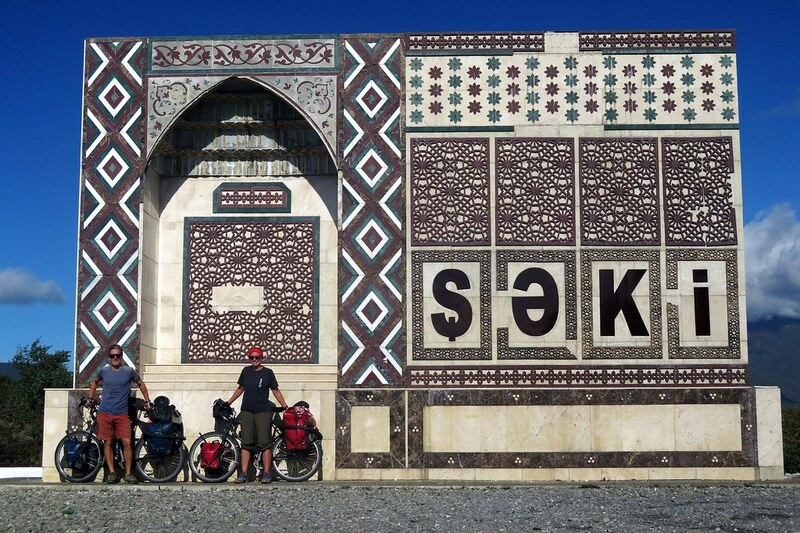 We were aiming for Seki, described in the Lonely Planet as Azerbaijan’s most picturesque town. It was a sunny day and we could see a lot more of our surroundings. 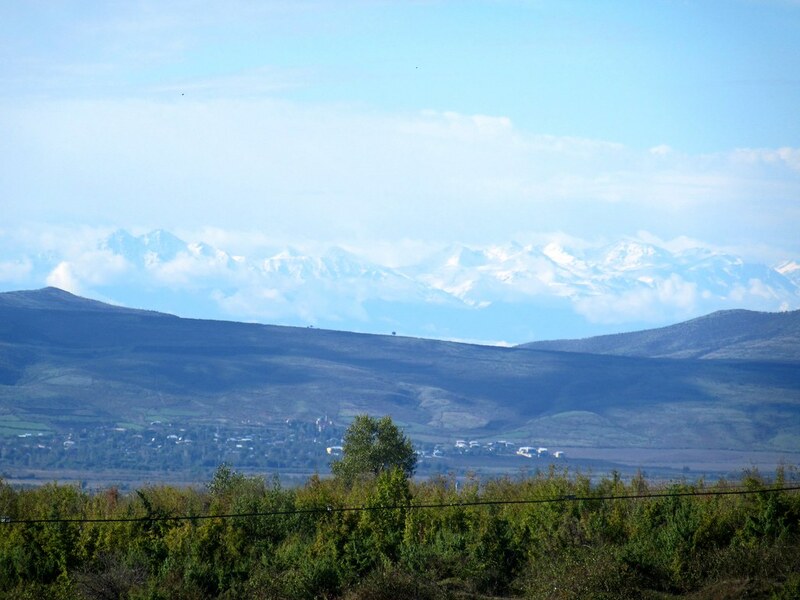 Across the valley to the south we could see snow capped mountains rising in the distance. I knew we had the Caucusus Mountains to the north of us, but I hadn’t realised there were such significant mountains in the middle of the country as well. 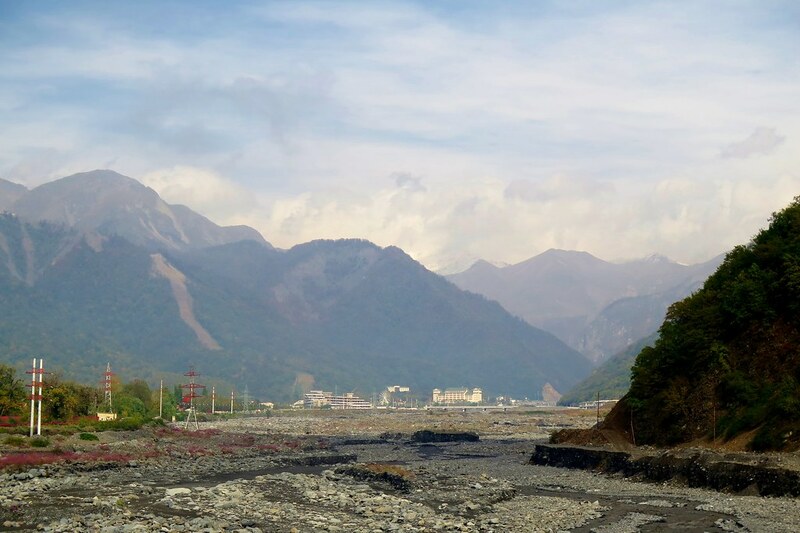 We started with a long gradual up, then had a long gradual down, taking us past the sign welcoming us to Seki. We left the main road to head into town and started climbing up towards the hills. The further up we got, the older and more interesting the buildings became. The last part of the ride was alongside a little stream on a cobbled street up towards the old town. We’d read about the old caravanserai that has been converted into a hotel so we were heading there. We arrived and walked through into a beautiful courtyard garden in the centre of the stone building. The rooms are tucked into the arches, small but full of character. It was a stopping off point on the old Silk Road, so it felt pretty cool to be staying in this old caravanserai on our own route from Asia. We’re having a day off here before continuing west towards Georgia. Hi Mark! Glad you’re still reading and enjoying. Yep, we’re taking our time aren’t we… must be enjoying ourselves too much! Feels like we’re getting a lot closer now though! Just catching up with you two…..sounds like winter is on it’s way (we’ve still got temperatures over 30 degrees here in Viet Nam and we’ve been missing autumn). Sounds like the ferry crossing all went well. 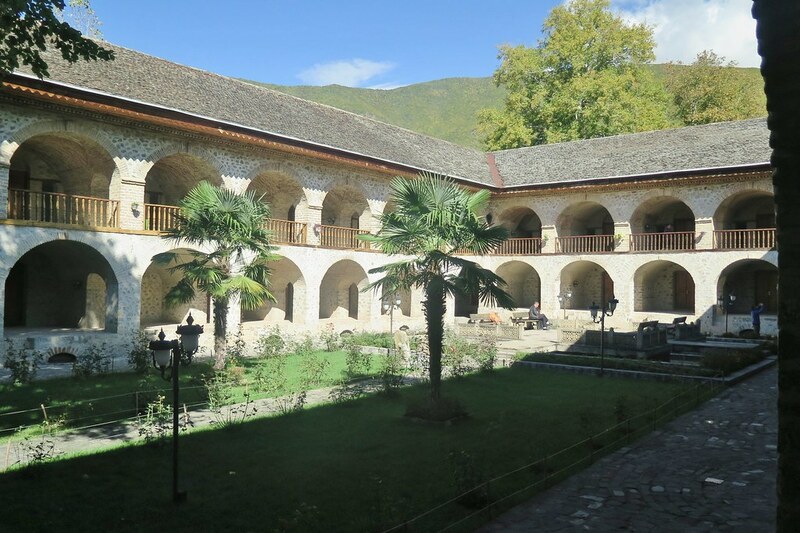 Great that you stayed at the caravanserai in Seki, we stayed there in Feb – very cold but cosey in our room. Hope you enjoy Georgia – Tblisi is nice and intersting too.